Daytona Beach and Palm Coast drivers know that the 2016 Toyota Yaris stands head and shoulders above every other subcompact on the market. After all, not many can offer outstanding efficiency scores alongside zesty performance, generous standard features next to remarkable safety devices, and plenty of space combined with a sleek, open design. The 2016 Toyota Yaris can. Keep reading to learn all about what’s on offer with this entrancing subcompact. The 2016 Toyota Yaris is one of the most versatile subcompact cars on the market, with three trim levels available and the option to drive either a 3-door or 5-door version. L: Starting at $14,895* for a 3-door or $15,995* for a 5-door, the L model is one of the most well-equipped models in its segment, with standard features such as a six-speaker Entune Audio sound system with a 6.1-inch touchscreen, a CD player, and Bluetooth phone and audio connectivity. LE: Starting at either $16,555* for a 3-door or $16,930* for a 5-door, the SE makes a number of upgrades to your driving experience. Expect a keyless entry system, cruise control, and steering wheel-mounted audio controls to come as standard. SE: A top-of-the-range SE comes in at $16,870,* and it is only available as a 5-door. Standing on eye-catching 16-inch alloy wheels, it boasts projector-beam headlights, LED running lights, and a leather-trimmed steering wheel and shift knob. Above all, the 2016 Toyota Yaris is defined by its ability to tackle the streets of Daytona Beach and Palm Coast like a dream, all while returning mileage ratings that are impressive even for a subcompact. Power is derived from a punchy 1.5L inline four-cylinder engine, which delivers up to 106 hp and 103 lb-ft of torque to the touch of your right foot. You’ll be free to choose between either a five-speed manual or four-speed automatic transmission, achieving up to 30 mpg in the city and 37 mpg on the highway* with the former and 30 mpg city and 36 mpg highway* with the latter. 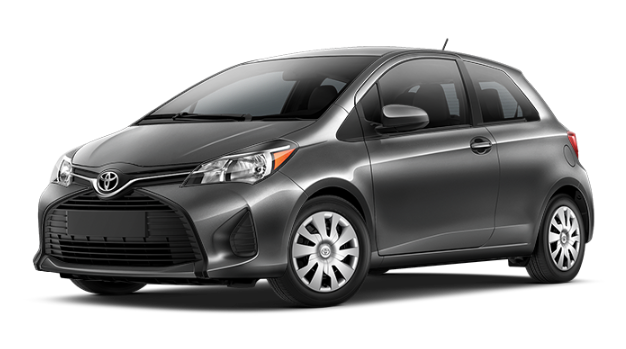 The 2016 Toyota Yaris always surprises Daytona Beach and Palm Coast drivers with its abundance of interior space, something you might not expect from so sleek and agile a vehicle. There’s up to 15.6 cu. ft. of cargo space, and a versatile 60/40 split fold-down rear seat comes as standard with every model to let you change the interior configuration in seconds flat. At the same time, the Yaris feels extremely open, with a 360-degree view letting you maneuver with total confidence. Appearance-wise, Toyota have opted for sporty appeal, with available piano-black accents and white stitching to brad your attention, plus an exciting range of standard features, such as an Entune Audio system with a 6.1-in. touch-screen display, and available features, such as a leather-trimmed steering wheel. Fun, nimble, and well-stocked, it’s no surprise that industry experts have been drawn to the 2016 Toyota Yaris. If you’re looking for a smaller vehicle that manages to offer both everything you want and everything you need, the 2016 Yaris is a clear front-runner. To check it out in the flesh, just come down to the showroom at Beaver Toyota or call us on (904) 567-3962 to arrange a test drive. We can’t wait to put our Daytona Beach and Palm Coast customers behind the wheel of this versatile subcompact!